Home › Friends › In which I go to prison…. In which I go to prison…. I really enjoy visiting my co-blogger Naomi. She lives in Houston Texas, and like most natives of Texas loves showing off her state. She will usually give me a list of choices for things we could do. One choice was the “Texas Prison Museum” in Huntsville. I have all the horrible stereotypical images of Texas prisons, hourly executions, toddlers on death row, chain gangs of women in low-cut uniforms that perform services for the guards, all of whom are all named “Bubba”. I suspected there were people in prison simply because they tanned too long and were taken for a minority when they asked for change at a convenience store. Heck yes I wanted to see the Texas Prison Museum! Opps, well "governor" is a hard word to spell. This works to cover the typo! I found Huntsville to be a really beautiful small town. There were horses in fields and lovely little restaurants. 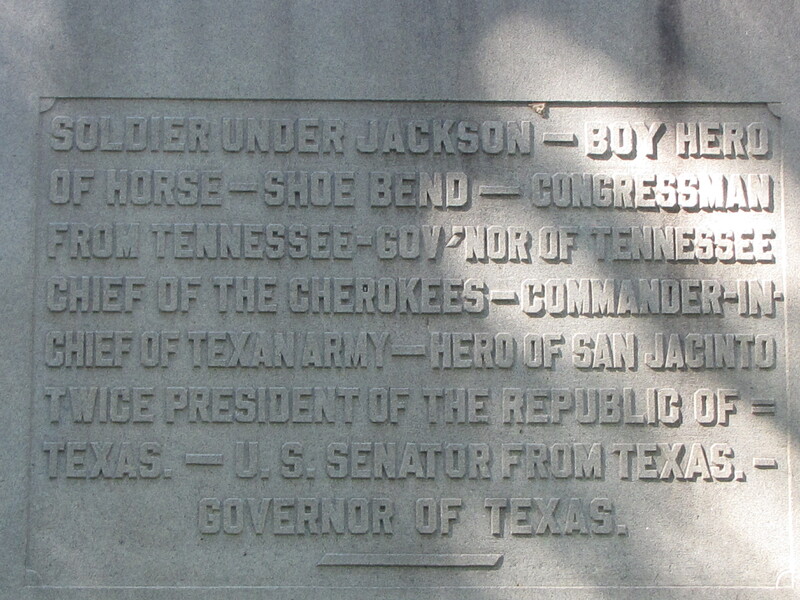 The grave of Sam Houston is there, and I was delighted to find his grave stone had a “typo”. This all put me in a very good mood for the prison museum. The prison museum is small, and was very quiet the day we visited. shiv in the flip flop, even surfer type dudes are not to be trusted! My good mood quickly sobered when I began to look at the exhibits. 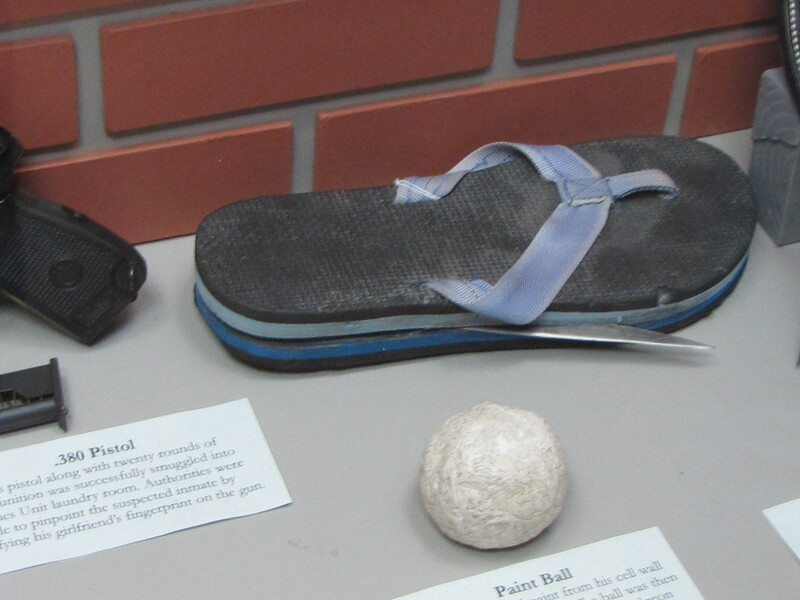 The variety of home-made weapons was a reminder, prison is dangerous. Dangerous not just for the guards but also for the prisoners. There was a wall of celebrities that had been incarcerated. A really wonderful exhibit featured the artwork and crafts of prisoners. As an artist myself, I imagine that art must be a wonderful mental release. I also hope that art and creativity are encouraged today in the prison system, if only to keep prisoners from going totally insane while being confined. It is better in your spare time for everyone if you are drawing rather than making a shiv. I was really touched by the last meal requests. I’m sure the prisoners had committed some terrible crimes. 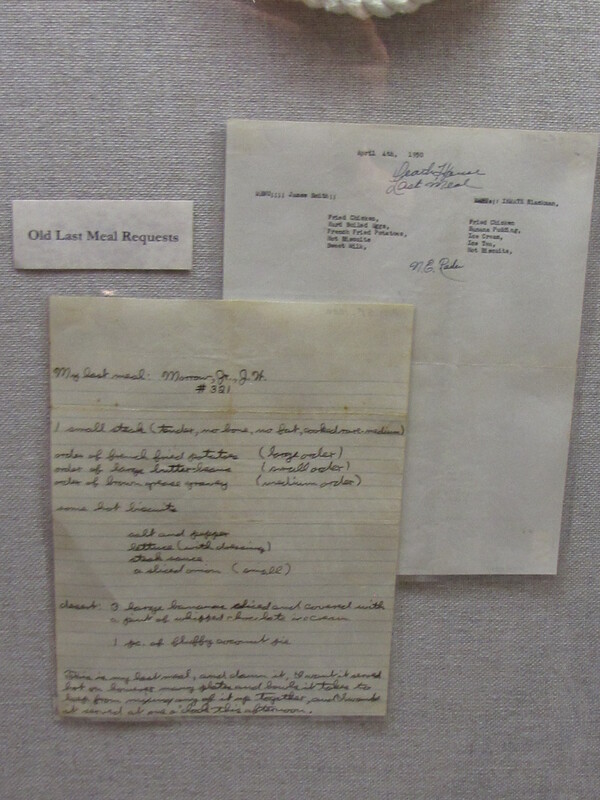 The meal request exhibit did not say what the prisoners had been convicted of. But it was touching to see the exactness of the orders. It was as if they wanted a last bit of respect and dignity before they died. I was told they no longer do last meal requests, and that made me quite sad. "This is my last meal, and damn it, I want it served hot on (?) as many plates and bowls it takes to keep from mixing any of it up together.."
A last wish for some dignity with a very specific last meal request. He wants it done right. I was also sad that there was no longer a Texas Prison Rodeo. This tradition was well documented. I don’t know why it was discontinued. My personal feeling is that giving prisoners something to work toward and to look forward to, would keep them mentally more sane and calmer. Prison violence is probably born out of boredom. While someone is in prison to be punished, a prison that is safer for guards and employees as well as prisoners serving sentences for lesser offences, is a good thing. Prisoners that occupied and have rewards they can work toward seems a positive to me. The prison rodeo appeared to be a real source of pride, and for many prisoners I am sure one of the few positive experiences they had ever had in their lives. Learning hard work can lead to a sense of self worth is a lesson any prison should be teaching. “Old Sparky” was a sight that totally turned the tide from “this will be so interesting” to “this is almost too much reality” for me. 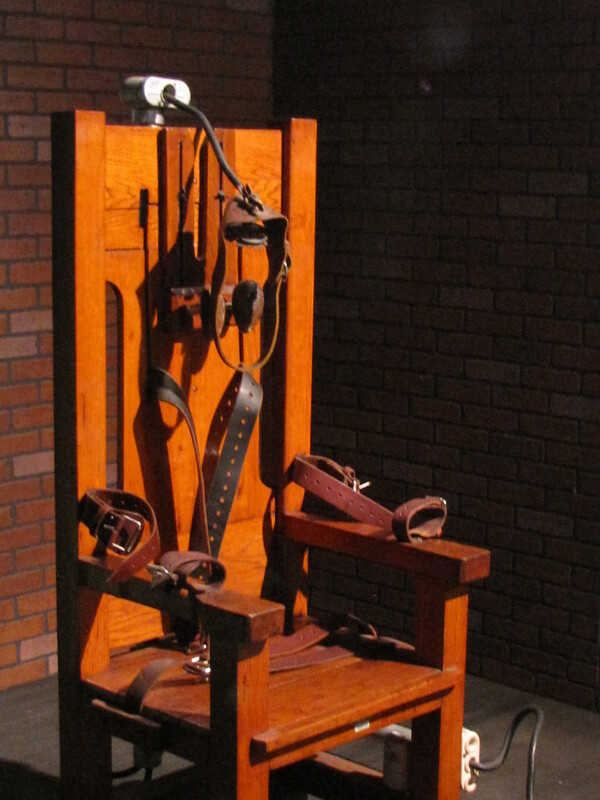 “Old Sparky” was the final resting place for 361 prisoners from 1924-1964. 361 people died sitting in a chair that looked like it had been made in a high school shop class. I read that the prisoners themselves had made the electric chair. I don’t have a video of a person dying in an electric chair, but I have seen some of the Edison footage of animals dying using this method. Topsy the elephant is probably the most poignant. I think for simplicity and basic home made design of the chair is what threw me. It’s sad to admit that I would probably have been more comfortable with a higher tech looking design. Something steel, polished and medical looking. Wood and bare wires brought home to me the stark reality that this was just killing in it’s most basic method, you were shocked, you died. Stories abound of prisoners that did not “just die” and required multiple shocks while having their bones shattered from the force of the shock. Like Topsy, smoke was involved. You were baked. This isn’t a post pro or anti capital punishment. However I do hope there may never be another “Old Sparky”. The Texas Prison Museum is well worth a visit. It’s very interesting and the museum is run not as an indictment on the prison system in Texas. The museum is a very balanced historical record showing all sides of the story of the history of prisons in Texas. It’s up to each visitor to decide if that history is one of pride or one of shame. I found it to be a bit of both.